Ali Bell and Cole Holland’s crew of zombie slayers thought they’d won the war against Anima Industries, the evil company responsible for capturing and experimenting on zombies in an effort to discover the secret to immortality. In the last epic clash, the slayers lost many of their crew and closest friends. But Frosty, the ice man himself, has not recovered from one casualty in particular—the love of his life, Kat Parker. On the path to self-annihilation, Frosty receives a message from beyond—Kat’s spirit returns, insisting he partner with rogue slayer Camilla Marks. Frosty will do anything for Kat. Except that. Camilla is the one who betrayed them all, leading to Kat’s death. But when Anima rises from the grave to become a force the slayers may not have the strength to overcome, Frosty, Camilla and all the slayers will have to work together to survive. And one broken slayer will learn that sometimes, the line between hate and attraction is blurred…and the road to redemption isn’t through revenge, but letting go of the past and grabbing hold of the future. "The color drains from her cheeks, but she raises her chin. A defense mechanism. Good. Words can be weapons. Mine are arrows, and they just struck their intended target." As a huge fan of The White Rabbit Chronicles, I couldn't pass this one up. It's a spin-off, told from alternating POV's of Frosty and Milla. Since Milla is part of the reason that Kat, my absolute favorite character from the series, is dead...let's just say that I didn't go into this as the biggest fan of her's. My absolute favorite part of this story is the fact that all the old characters that I love are still here. Including Kat, since she's a witness now. Witnesses are like angel ghosts that can visit and send messages and help from beyond. It was a lot like reading one of the others. There is a big bad that they are up against along with some zombies. Different powers make themselves known and the plot ramps up when some of their regular powers no longer work. It was great to see the groups working together to get the situation solved. Showalter hasn't been afraid of killing off characters, and I love that the action has that kind of significance. 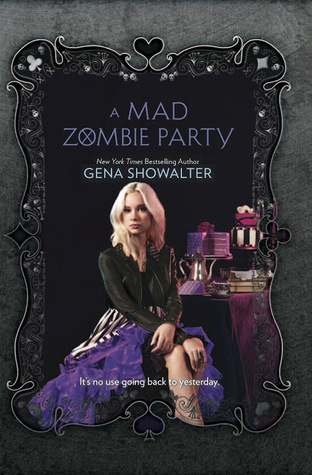 There were some new developments in Mad Zombie Party, so even though it was a spin-off, this ended up being a better conclusion for the series as a whole. We got more information that I enjoyed having to wrap things up with these characters. The only bad spot in this book is that Ali's character is quite sassy and fun, as well as able to make fun of herself in her own thoughts. While it was interesting to get in Frosty's and Milla's mind, I missed the character that I had gotten so close to with the rest of the stories. Since Milla was instrumental in the circumstances that resulted in Kat's death, Frosty and most of the others understandably hated her. Showalter had a difficult job of showing us not only her vulnerable side, but also why she should be forgiven. It was a fine dance to make the romance that blossomed between Milla and Frosty believable, but she did a wonderful job with it. If you are a fan of The White Rabbit Chronicles, you should absolutely pick this up. Of course, I would not read it unless you have read the series because I don't really think it'd work as a stand-alone. I enjoyed the time with characters that I've come to love, and appreciated getting to see things wrap up here for the whole series. "Is this an intervention?" I take one of two empty seats and signal the waitress for a coffee. I'm going to need it. "No, but it probably should be," Ali says. "You look like dog crap that's baked in the sun a little too long." Her mouth has always lacked any type of filter, a problem exacerbated by her refusal to lie about anything. Two qualities guaranteed to turn every conversation into a battlefield. But that's okay. Give me blunt truth over charming flattery any day. This is no one's fault but my own, and I won't make the same mistakes. I won't. And I'm not helpless. I can do everything in my power to create a better future. Starting now, with Frosty. I would forever hate anyone who hurt River, just as Frosty will forever hate the people who hurt Kat. I can't ever make up such a loss to him, but I can damn sure try. And I will. Girls. Can't live with them-the end. I mean, seriously. There are two ways to argue with them, saying yes and saying no, and neither way works.